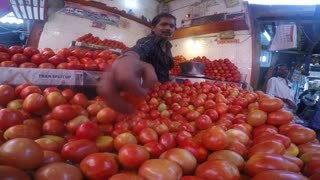 Search Results for "picking tomatoes"
MUMBAI, INDIA - 8 JANUARY 2015: Man picking tomatoes from a large pile at market stand and weighing them. UNITED STATES 1950s: Agricultural workers pick tomatoes. A shot of irrigation streams in a field. Agricultural workers picking oranges from trees. Aerial camera looking down at men picking tomatoes takes off and ascends quickly to reveal a field of tomato plants and a tractor pulling a flatbed loaded with tomatoes.